The TL-MR3040 is a 150Mbps portable battery/USB powered 3G/4G wireless router designed to broadcast and allow users to share a single USB 3G/4G modem connection wirelessly. The device is ideal for travel, particularly across bor-ders where 3G/4G protocols may differ. With a powerful internal 2000mAh battery, TL-MR3040 is capable of powering 4-5 hours of operation at full capacity. We take pleasure in introducing ourselves as leading firm by offering Lithium Ferro Phosphate Battery. 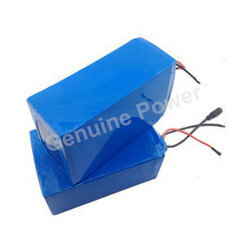 Rechargeable Lithium Ion Battery Energy type. 2). Model: ICR18650-2200-2S1P battery with Molex 5264-2P connector. 3). Nominal Voltage: 7.4V. With our rich industrial experience and expertise, we are engaged in presenting a quality range of Portable Battery to our customers. This Portable Battery has high tensile strength and can handle varying temperatures. Our range can be conveniently installed and needs minimal maintenance. Moreover, it is abrasion resistant. Matching up with the ever increasing requirements of the customers, our company is engaged in providing Portable Battery.